Were you on vacation last week? Away from the computer? Did you miss our giant 2010 Year in Review special? It's available all year, including the Rant, right here! *Welcome to the new year - and to new formats at a bunch of signals from one end of NERW-land to the other. That's in the Albany, NEW YORK market, where Townsquare Media flipped WBZZ (105.7 Malta) from AC "Buzz" to all-Christmas music as "Santa 105.7" back on November 1, one of the season's first flips - and where "Santa" stuck around for an extra week, long after most of the region's other Christmas stations had unceremoniously switched back to regular programming on or just after Christmas Day. At midnight, "Santa" finally flew out of the Capital District, leaving behind a new station called "105.7 Crush FM," with new calls WQSH. The new format is billed as "90s and More," a close cousin to the "Gen-X" formats that have launched recently in markets such as Louisville, St. Louis and out on Long Island, and it promises to mix a heavy diet of pop hits from the 1990s with a handful of compatible songs from the preceding and succeeding decades. "Basically this is the music you enjoyed during your halcyon days and havent heard much of in the past few years  until now," says the station's website. No airstaff is listed, but we'd expect some announcements shortly. *Moving down the Hudson Valley, the new year will start with new morning shows at two stations: at Clear Channel's WBWZ (93.3 New Paltz), Chris Marino takes over as PD and replaces Mark Bolger as morning man on the hot AC station ("Star 93.3"), where he'll be joined by Jess Peters, who'd worked with Marino across town at WSPK (104.7). Marino keeps his PD duties down the hall at WPKF (Kiss 96.1), but he gives up his afternoon shift there, to be replaced by Star afternoon jock Fuzzy, who will in turn be replaced by Kiss night guy Tony Flash. Meanwhile at Pamal's WBPM (92.9 Saugerties), "Robinson and Sean" will be the new morning team, starting next week. *In the Mohawk Valley, Bill Keeler starts 2011 without a radio station. The veteran Utica air personality had been doing mornings on WXUR (92.7 Herkimer), but station owner Mindy Barstein is installing the syndicated "Bob & Tom" on 92.7 beginning next week, returning them to Utica morning drive for the first time since Clear Channel sold former Bob & Tom outlet WOUR (96.9) a few years back. Keeler had been leasing the morning hours on WXUR, and he says he wanted the station to succeed. "I took a radio station that nobody knew about and helped it get a name in this area," he said in an article on his Utica Daily News website announcing his departure. Keeler says he was offered the afternoon slot on WXUR but turned it down, and he says he'll keep publishing the online Daily News while he looks for new opportunities. *In Syracuse, Clear Channel didn't just migrate its WSYR news-talk format to the FM dial Sunday night - it's not even acknowledging WSYR's eight-plus decades of history on the AM dial now that "FM Newsradio 106.9 WSYR" is on the air. The transition began on Dec. 22, when Clear Channel pulled Fox Sports Radio off the air at WHEN (620) with no warning at 3 PM, replacing the sports station with a simulcast of WPHR (106.9 Solvay), which began rebranding the next morning as "Power 620," directing the urban FM station's listeners down to the AM dial to continue to hear the format. A few days later, Clear Channel filed to return the WSYR-FM calls to Syracuse (where they were heard until the mid-80s on 94.5, now WYYY), swapping them with WPHR on "Star 94.7," a Clear Channel-controlled AC station serving West Palm Beach. At 7:00 Sunday night, "Power" disappeared from the FM dial, replaced by "FM Newsradio 106.9," the latest in a string of recent Clear Channel AM-to-FM talk moves. Does the FM-only branding on this one indicate that the simulcast with 570 will be only temporary, perhaps with Fox Sports returning to the AM dial at 570 once the transition is complete? And how will Syracuse's urban community react in the new year to the loss, once again, of the city's only FM that programmed to them? Clear Channel drew fire from the community when it pulled Power off the air a few years ago to stunt 106.9 with a country format, and the AM 620 signal, though it has excellent coverage of the city and beyond, isn't likely to be seen as a worthy substitute for Power's former FM signal. *On TV, the new year looked set to dawn with some dark screens on cable and satellite systems around the region, but most of the high-profile carriage disputes were either resolved or extended with just days or mere hours to spare. Hearst and DirecTV reached a long-term carriage deal on December 30, keeping ABC affiliates in Boston, New Hampshire, Maine and Pittsburgh and NBC stations in Vermont and New Hampshire on the satellite - and then Sinclair and Time Warner Cable reached a temporary agreement on New Year's Eve to keep Fox and MyNetwork stations in Pittsburgh, Buffalo, Rochester and Syracuse and CBS in southern Maine on cable for two more weeks while they continue their negotiations. The Sinclair/Time Warner talks took a particularly interesting turn in the last days of 2010 when Time Warner announced that it had struck a deal directly with Fox to continue supplying network shows to the cable operator, completely bypassing Sinclair and significantly reducing its leverage in carriage negotiations. Time Warner Cable had already shown its muscle earlier in the month when it replaced Smith Television's WKTV in Utica and WVNY in Burlington with out-of-market NBC and ABC affiliates, a move that prompted as-yet-unresolved legal wrangling among Time Warner, Smith and Nexstar, whose WBRE Wilkes-Barre and WUTR Utica were being imported against its wishes. Here in Rochester, there was yet another twist: as Sinclair Fox affiliate WUHF (Channel 31) looked poised to vanish from cable screens, Newport's WHAM-TV (Channel 13) suddenly announced the addition of a 10 PM newscast on its CW subchannel (cable 16/DTV 13.2), clearly meant to grab viewers who'd been watching WUHF's 10 PM news in the event it went dark on cable. Even though WUHF stayed on cable, WHAM launched its new newscast Saturday night (Jan. 1); a new anchor for the 10 PM show will be announced soon, we hear. And while we wait to learn what will become of Sinclair and Time Warner (though we'd note that an extension almost always leads to a resolution pretty quickly), we note that one more upstate TV signal quietly disappeared from some screens at year's end: Northwest Broadcasting, the successor to the old Stainless Broadcasting, has been unable to reach a deal with DirecTV, and that meant its stations - Fox outlets in Spokane, Yakima, southern Oregon and Binghamton's WICZ (Channel 40) - disappeared from DirecTV on New Year's Day. *An obituary from New York City: Dr. Billy Taylor will be best remembered for the legacy he left in the jazz world, where he was a prominent pianist and composer for many decades, not to mention a longtime contributor to "CBS News Sunday Morning" and the musical director of David Frost's talk show in the early 1970s. But Taylor had a long career in radio as well. After working as a musical director for several NBC radio shows, Taylor became a DJ at WLIB (1190) in 1959. He took a brief detour to WNEW (1130) from 1962-1964, but soon returned to WLIB as more than just a jock. Taylor programmed WLIB, and in 1971 he joined forces with Percy Sutton to create Inner City Broadcasting, which purchased the station. Taylor was a founding partner and board member at ICBC, and he even did mornings on WLIB in the early months of ownership there. Later in the decade and well into the 1980s, Taylor became a fixture on NPR, hosting several series including "Jazz Alive." He also appeared frequently on TV, not only as arts correspondent on "Sunday Morning" but as the host of shows on WNJU (Channel 47), Bravo and elsewhere. Taylor died Tuesday (Dec. 28) at 89; ironically, a year almost to the day after Sutton's death. It's 2011 now - and that 2010 calendar on your wall won't do you much good, will it? But wait - there's more! We now have a small supply of the new FM Atlas, 21st edition, as well as a limited supply of Tower Site Calendar 2010 as well - plus signed calendars, back isues and much more in the fybush.com store! Orders of 20 or more calendars get a discount. We'll even add a bow or a gift card upon request. *Radio People on the Move in MASSACHUSETTS: Ben Parker is coming back to Boston after several years of mornings at WPKZ (1280 Fitchburg). The former WRKO newsman has been hired as a reporter at WBZ (1030), but he says he'll advise WPKZ as it transitions to a new morning host. Station veteran "Ray C" will be back in mornings this week, but it appears the permanent morning host there will be Rich Teter, last heard at Worcester's WCRN. And on the North Shore, Keating Willcox isn't just leasing WNSH (1570 Beverly) to the Merrimack Valley-based Costa-Eagle group: he's now filed to sell the station outright. Costa-Eagle will pay $400,000 for the station, which began simulcasting WNNW (800 Lawrence) late last year. *The "Champ" is no more in VERMONT: as had been widely hinted in the days leading up to Christmas, New Year's Day brought a new format to replace the classic rock that has long been a staple on Vox's WCPV (101.3 Essex NY). The first format flip in WCPV's 17-year history brought ESPN Radio over to the FM dial in the Burlington market. The new "ESPN 101.3" has one local show, "Rob & Rich" with Rob Ryan and Rich Haskell, debuting this afternoon from 4-6 PM. The rest of the day is network programming, moving ESPN over from Northeast Broadcasting's Champlain Valley AM trimulcast of WCAT (1390 Burlington), WRSA (1420 St. Albans) and WFAD (1490 Middlebury). Those stations flipped from ESPN to Fox Sports Radio - and the airtime Fox Sports used to get on Vox's WEAV (960 Plattsburgh NY) has been filled with more syndicated talk. *There's a new signal on the air in central NEW HAMPSHIRE: WPVH (90.7 Plymouth) filed for its license to cover December 21. The station, owned by the Wentworth Baptist Church, is carrying programming from the North Carolina-based Fundamental Broadcasting Network; it joins WOGM-LP in Jamestown, New York as that network's second NERW-land affiliate. *A post-Christmas format change in MAINE: after less than a year as "The Edge," WCTB (93.5 Fairfield) stopped rocking last week, flipping to the satellite-fed True Oldies Channel, already heard on sister station WSKW (1160 Skowhegan). *Radio People on the Move in CONNECTICUT: WDAQ (98.3 Danbury) is on the hunt for a new program director and afternoon guy as Zach Dillon moves on - he'll leave "98Q" on January 14 to move to Waco, Texas, where he'll be PD/morning man at KWTX-FM (97.5). On the TV side, WSAH (Channel 43/RF 42) in Bridgeport is in the hands of a trustee as the station goes up for sale. Multicultural Broadcasting, which has had plenty of success operating leased-time radio stations, tried to follow the same path into TV, but with far less luck: creditors had already forced Multicultural to turn over four of its TV stations, including Boston-market WMFP (Channel 62/RF 18), to trustee Lee Shubert. As 2010 drew to a close, Multicultural filed to move WSAH into the trust as well. Shubert has already sold two of the stations Multicultural bought from Scripps for $170 million back in 2006 (that's where the "WSAH" calls came from - the station once carried Scripps' Shop-At-Home Network), and now he'll try to sell WSAH, WMFP and KCNS in San Francisco. WSAH currently carries infomercials on 43.1 and Chinese-language programming on 43.2; while Bridgeport is part of the New York City DMA, the station has never had full cable or satellite carriage across the number-one market. *The biggest change in PENNSYLVANIA radio was one we'd known about for a few months now: the New Year's Day switch from ESPN Radio to Radio Disney at Pittsburgh's WEAE (1250), which had been by far the smallest-market owned-and-operated signal in the ESPN Radio fold. Meanwhile in Pittsburgh, the ESPN affiliation moved over to Clear Channel's WBGG (970) right on schedule New Year's Day, with a new schedule on 970 that includes veteran Steel City sports talker Stan Savran from 10-11 AM on weekdays, leading into the local "Tunch and Wolf" show from 11-1, followed by an hour of Jim Rome, two hours of ESPN's Scott Van Pelt and three hours of local talker Joe Bendel. And what of former Radio Disney outlet WWCS (540 Canonsburg)? That station, owned by Birach Broadcasting, has been running a repeating loop directing Disney listeners up the dial to 1250, with no word yet on what programming might show up there next. *Where are they now? Former Pittsburgh morning man John Garabo had been in the Cayman Islands, working at ZFKY (Rooster 101), but he's now leaving the Caribbean in search of work back in the States. *Erie public broadcaster WQLN (channel 54/FM 91.3) is suing the local authority that operates the Presque Isle Downs Casino, saying it should have been included among the Erie-area nonprofits that receive a share of the casino's revenues. The authority shares revenue with nonprofits deemed to be "dedicated regional assets," and WQLN says it meets those criteria, including "hav(ing) a strong history of service to the community, a large operating budget and a regional audience base." 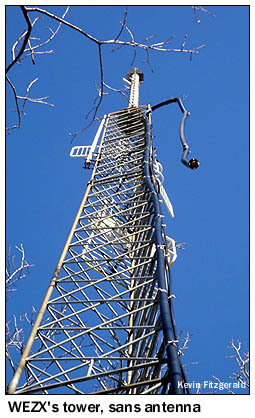 *In Scranton, the new year started with a temporary antenna for WEZX (106.9), which suffered damage from a windstorm that ripped across its site atop Montage Mountain last Monday afternoon (Dec. 27). Kevin says a new antenna will soon be on order for WEZX, and he hopes to have the station back to full power (with HD restored) before too long. *There's a new slogan at Philadelphia's former "Big Talker." WPHT (1210) is now branding itself as "Talkradio 1210" as it prepares to launch its new program schedule today. The new lineup brings Chris Stigall to town to do mornings and knocks Sean Hannity and Glenn Beck off the Philly airwaves for now, with no replacement affiliates yet having been named. *WPAZ (1370 Pottstown) is back on the air under the management of the WPAZ Preservation Association, the nonprofit that's in the process of buying the signal from the Four Rivers ("Word FM") group, which acquired WPAZ from longtime owner Great Scott Broadcasting. WPAZ went silent on December 10, 2009, when Great Scott abruptly pulled the plug on the station, but it's been back with automated music since early December to hold the license. Not far away, one more new station slid in under the wire just before Christmas: with just a couple of days to spare before its construction permit was to have expired on December 26, Berks Radio Association completed construction of WKTW (91.3 Longswamp Township), applying to the FCC for a license for the 22-watt signal. The new station transmits from a site north of Boyertown, using a directional antenna aimed south at Boyertown and Pottsville. And speaking of Four Rivers, it's been granted another construction permit to extend its "Word FM" network: the newest signal will be at 90.9 in Elysburg, with a 290-watt/643' directional signal aimed east at Shamokin and west at Sunbury. 12 months, one page - all the year's news and events in one place! *It was a very quiet few weeks in CANADA, though it starts with at least one big personnel move: Milkman UnLimited reports Brian DePoe is headed down the Autoroute from Montreal's CFQR (92.5 the Q) to become PD at Ottawa's Majic 100 (CJMJ) and 93.9 BOB FM (CKKL), effective tomorrow. *Meanwhile, the CRTC denied a request from Radio Dégelis to add a transmitter at Rivière-du-Loup, Quebec, to relay its CFVD (95.5 Dégelis). CFVD said it needed the 5750-watt signal at 102.5 to maintain its own financial viability, but the two existing commercial stations in Rivière-du-Loup told the CRTC that they're also in tough financial straits that would be further compromised by a new competitor. The CRTC also turned thumbs-down on an application from CKGS (105.5 Saguenay) to add a second transmitter on 105.9. The new transmitter would have extended CKGS' reach from the La Baie area to Chicoutimi and Jonquiere, two of the larger cities that were amalgamated into Saguenay a few years back, but the local broadcasters in those cities successfully complained of the new competition that the 250-watt CKGS relay would have provided. As 2009 drew to a (merciful) close across the broadcast landscape, the obituary pages were full of notable broadcast names, seemingly nowhere more so than in NEW YORK, where the days around Christmas brought one piece of sad news after another. Christmas Eve brought word of the death of a legendary top-40 voice, George Michael, who went on to a second incredibly successful career as a TV sportscaster. After an early stint as a music promoter followed by DJ jobs at stations in Wisconsin, Missouri and Colorado, Michael shot to fame as one of the original "boss jocks" on Philadelphia's WFIL (560) back in 1966, and he was the second big WFIL personality we lost in 2009, two months after the death of his colleague Jim Nettleton in October. As WFIL's night jock, "King George Michael" quickly became a legendary figure, winning numerous awards and dominating the ratings. Michael moved north to New York's WABC in 1974, replacing Bruce Morrow on the night shift at "Musicradio 77" and becoming one of the dominant voices of the station's last decade as a top-40 giant. The next phase of Michael's career began in New York, where he worked as a weekend sports anchor on WABC-TV, a gig that led him to fulltime TV work beginning in 1980 as sports director at Washington's WRC-TV, a job he held for more than a quarter of a century. Along the way, a local sports highlight show evolved into the syndicated "George Michael's Sports Machine," one of the most successful syndicated shows in the history of local TV. Michael had been fighting cancer since 2007, though he was well enough to travel to Philadelphia in 2008 to be inducted into the Broadcast Pioneers Hall of Fame. He was just 70 when he died December 24. Christmas Day brought another obituary, as the New York radio community lost its good friend Henry Lewis, a staple of the city's radio dial for more than 60 years. Born Henry Lewis Lilienthal, Lewis' broadcast career began back in 1945, when he was a teen announcer on WNYC's Police Athletic League broadcasts, and it was with that station that he was most closely associated, working there as a staff announcer in the fifties, again in the sixties, and once again from 1987 until he was hospitalized in November. In addition to his WNYC work (most recently as a Saturday-night music host on WNYC AM 820), Lewis had worked at numerous other New York stations, including WINS, WNEW, WQXR, WNCN and WRFM. Lewis was 77. And on the day after Christmas, New York lost one of its most notable broadcast owners - though station ownership was just one small part of the legacy of Percy Sutton, who was born the son of an ex-slave and rose to become one of the city's most powerful political figures. The Texas native first came to prominence as a civil rights lawyer in the fifties and early sixties, counting Malcolm X among his clients. He was elected to the state Senate in 1964 after numerous failed attempts, and two years later became Manhattan borough president, holding that post for more than a decade before making an unsuccessful run for mayor of New York. By then, Sutton was also a radio station owner. In 1971, he bought the Amsterdam News, the city's most prominent black newspaper, and followed that up later in the year by buying WLIB (1190), making it the city's first black-owned radio station. Three years later, Sutton's Inner City Broadcasting (whose partners included eventual New York mayor David Dinkins) added WLIB's sister station, WBLS (107.5), to the group, which would eventually expand to 18 stations as far afield as San Francisco and Texas, with additional business interests that included cable systems and the famed Apollo Theater in Harlem. Sutton was 89 and suffering from dementia when he died in a New York nursing home on December 26. MAINE's own Stephen King is taking a chance on progressive talk at one of his Bangor-market FM stations. WZON-FM (103.1 Dover-Foxcroft) moved to a new tower site with improved reach into Bangor not long ago, and it's dropping its relatively short-lived simulcast with sports WZON (620 Bangor) effective today to become "The Pulse." The new station's lineup includes syndicated liberal talkers Bill Press (6-9 AM), Montel Williams (9-noon), Ed Schultz (noon-3 PM), Randi Rhodes (3-6 PM), Ron Reagan Jr. (6-9 PM), Stephanie Miller (9 PM-1 AM), Joey Reynolds overnight and a 5 AM replay of Rachel Maddow's MSNBC show, as well as local news and CNN Radio national news. The station may add a local talk show in the future as well. The weeks around Christmas and New Year's are typically very slow ones in CANADA - but this year brought one big format flip in the nation's largest market. Astral's CJEZ (97.3 Toronto) emerged from all-Christmas with new calls and a new format, ditching AC "EZ Rock" for classic hits with a strong 80s flavo(u)r. The new format, called "Boom," is an import from Astral's network of stations in Quebec, where the music is similar but the announcers are in French. Toronto's new CHBM (Boom 97.3) has some familiar English-language voices behind the mike, carrying over morning hosts Humble Howard and Colleen Rushholme and afternoon jock Kris "KJ" James and adding former CHUM-FM jock Maie Pauts for middays.